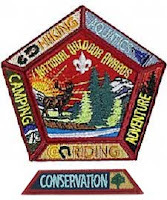 In addition to Merit Badges Scouts may earn various awards. Below is some information on a few of the awards available to Scouts. Additional awards and the requirements for each can be found on the Scouting.org Awards Central page or in ScoutBook under Advancement > Awards. The National Outdoor Achievement Award recognizes Boy Scouts that excel in outdoor participation. The award consists of five areas of emphasis (camping, aquatics, hiking, riding and adventure) with rigorous requirements to earn each segment. For Scouts looking for an extra challenge, the National Medal for Outdoor Achievement. This challenging award requires earning at least three of the National Outdoor Achievement segments, planning and leading a trek, earning Wilderness First Aid and becoming a Leave No Trace Trainer as well as several other requirements. The Conservation Good Turn is an opportunity for Cub Scout packs, Boy Scout troops, Varsity Scout teams, and Venturing crews to join with conservation or environmental organizations (federal, state, local, or private) to carry out a conservation Good Turn in their home communities. The Hometown U.S.A. Award is a joint program between Keep America Beautiful Inc. (KAB) and the Boy Scouts of America. It is designed to give recognition to the outstanding efforts of Scouts in their communities in regard to citizenship and environmental improvement. The emergencies of today's world demand more than ever that our young people and adults be trained as individuals and as units to meet emergency situations. This program fosters skills in our youth and adult members so that they can participate effectively in this crucial service to their families, communities, and nation. To encourage members to grow stronger in their faith, religious groups have developed religious emblems programs. Insignia and awards are available to show your involvement in the world Scouting movement.